Has the media lost sight of the real victims from July's brawl involving WSU football players? WSU head coach Mike Leach has publicly defended his players arrested on assault charges this year. On a Friday afternoon, a group of reporters gather with their cameras, microphones and notebooks in front of Robert Barber, the Washington State University football player at the center of a controversy that could change the way WSU disciplines students. Barber remains quiet — resting his hands at his side, looking down, shuffling his feet. To his right is an attorney, to his left, a state senator. "He is receiving special punishment — special and unfair punishment," says state Sen. Michael Baumgartner, accusing WSU of mistreating the student-athlete. "It should not be accepted." Other students were suspended in connection with the same July brawl that got Barber in trouble, including a teammate and a non-football player. But it was only the high-profile player, Barber — a fifth-year senior one credit short of graduation — standing in front of reporters next to Baumgartner. Baumgartner, a WSU alum, had just yelled at the Board of Regents and President Kirk Schulz, "If you don't fix this, I goddamn will!" He had the media's full attention. It was the latest development in a story that, experts agree, would never have received much media attention had it not involved a high-profile local sports figure like Barber. And months after the brutal fight, fair or not, the media's narrative has effectively turned Barber into the main victim. "I think, overall, this would not have gotten any play in any paper — beyond a brief in crime reports on the inside of the metro section — if it had not involved football players," says Sonny Albarado, a media industry expert for the Society of Professional Journalists who reviewed media coverage at the Inlander's request. "The trend of reporting is that it's all about this one guy and making him look like he is the victim." It's been more than three and a half months since Barber, a 6-foot-3, 300-pound defensive lineman, punched another student twice, so hard, as the school described in documents filed in Whitman County Superior Court, that the student fell unconscious and didn't wake up until paramedics were standing over him, as he bled from the back of his head. Barber has never disputed that he hit this student. It's seen clearly on video, a video showing fists flying all over the place during a brawl in the early-morning hours of July 23. Barber told the school he felt threatened and that's why he hit the student, even after the student had already fallen to the ground, according to court documents. The school didn't buy it. Barber was initially expelled by the school's University Conduct Board on Sept. 7, but the punishment was reduced to a suspension upon appeal. Teammate T.J. Fehoko, who has never actually played in a WSU football game, allegedly hit a student who was left that night with a severely broken jaw. Fehoko was expelled by the school. Student Pedro Diaz, who threw punches during the fight, will be suspended starting Jan. 1. Barber and Fehoko were arrested for felony assault, and prosecutors have yet to make a charging decision. None of these students has received the support or attention Barber has received. This is not uncommon, says Gene Policinski, a founding editor of USA Today and an expert in journalism ethics. "When athletes are involved, there's a natural tendency to ask if they have been prosecuted unfairly, because of visibility, or have been given a pass. Reporting over the years has shown both instances occur," he says. Both tendencies were present in media coverage locally. The Inlander wrote a story in August based in part on interviews with the victims of the incident and Diaz, all of whom were concerned that the football players at the party would be given a pass. But shortly afterward, two other WSU football players were arrested on assault charges for unrelated incidents. 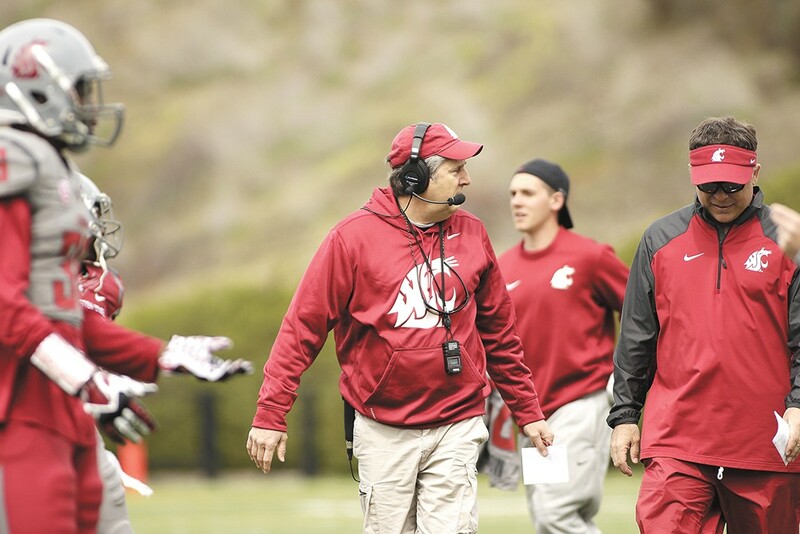 Cougars head coach Mike Leach accused the Pullman police of targeting his players. The media jumped on it. Leach's accusations made national headlines and generated a polarizing discussion about whether the athletes were being punished for their visibility, despite little evidence of any targeting. KXLY, for a local example, asked 700 ESPN's Dennis Patchin if that were the case, and he confirmed that Leach's accusations were similar to those from past coaches — though he never named any. Then, days before Barber began missing football games, the Seattle Times wrote an extensive article questioning the fairness of the WSU student conduct process that disciplined Barber. While the experts quoted in the story praised WSU's process for affording more due process than other universities, it raised concerns as well. The article focused on Barber, specifically, quoting advocacy groups accusing the school of racial bias and of not handling his case properly, without actually presenting any details of how Barber's case was handled. It did not take into account how, as WSU has since made clear, the process is intended to protect campus and victim safety, including for cases that may involve sexual assault as mandated by federal Title IX standards. When Spokane attorney Steve Graham filed a motion to stay any disciplinary action against Barber, accusations that the school had made procedural errors in its decision to discipline Barber fueled outrage on social media. As a result, the school announced an independent review of its processes and filed its own motion in response, supporting its decision on Barber. Kelly McBride of the Poynter Institute, a nonprofit school for journalism, says that situations involving athletes like Barber can be hugely influential. When someone is popular, she says, they can convert that popularity into pressuring the system to work in their favor. Lost in much of the coverage were the students seriously injured, or discussion of how the student conduct process impacts other people, notes the Society of Professional Journalists' Albarado. "It's unfortunate, but it's the nature of what we do," Albarado says. "The high-profile people get the attention." Last week, Schulz opened the public comment period of the Board of Regents meeting with a statement, perhaps intended to disarm the crowd. Barber, Schulz announced, would be allowed to graduate with an online course. All of a sudden, teammates, members of a booster group and Baumgartner — the same people who had repeatedly said none of this was about football — changed their tune. It was, they argued, about Barber's chance to play football again. There was still no mention of Fehoko, his lesser-known teammate. The hours-long meeting showed overwhelming support for Barber. Finally, one woman in the crowd pointed out that nobody there was defending the guy who Barber hit. The next person to speak? Alex Rodriguez, the student who suffered a broken jaw in the brawl. He wanted to talk about the mental and physical trauma he experienced after the fight, trauma that forced him to drop a class. And he wanted to defend his friend, the one struck by Barber at the party.